Do you offer freemium software in hopes users will eventually convert to a paid subscriber? Are you frustrated at the number of visitors to your site who leave without even trying your software, even though it’s free? In this case study, we’ll share how LifterLMS uncovered thousands of leads for the free version of their learning management software and added tens of thousands of dollars to their bottom line by boosting their freemium conversion rate in the process. LifterLMS helps education entrepreneurs create, sell, and protect engaging online courses from any WordPress site. Chris Badgett from LifterLMS joined us to share how they’re using OptinMonster to convert free users into paying subscribers. Though many customers use OptinMonster to add subscribers to an email list, that’s only one of the many ways it can be used. Let’s take a look at how they accomplished each of these using OptinMonster. 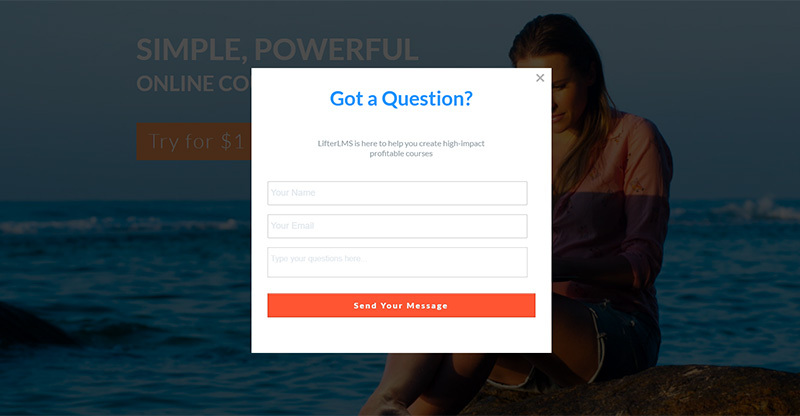 On their pricing page, LifterLMS wanted to both increase conversions, and capture abandoning visitors. To do this, they added two optins: a floating bar optin and an exit-intent optin. The floating bar optin offers a coupon code good for 10% off the purchase. This optin also includes a dynamic countdown timer to increase the urgency of the offer. The dynamic timer is customized for each visitor. Instead of selecting an end date, you choose the length of the timer in days, hours, minutes, and seconds. The dynamic timer will begin the countdown as soon as the visitor hits the page. That means that each visitor will see a different countdown. When a Dynamic Timer reaches its deadline, the timer will start over automatically. This optin converts at around .5% of readers to the pricing page. In the five months since this optin has been live, it has been responsible for adding $23,700 in LifterLMS sales. LifterLMS went on to tackle one of the biggest challenges for any business online: recovering website visitors not ready to take an action. These visitors are obviously interested in what you offer, or they would not have visited your site in the first place. But if they’re not ready to make a purchase, what can you do besides let them leave? Turns out, there’s a lot you can do. After hearing OptinMonster CEO Syed Bahlki on the Perpetual Traffic podcast share six powerful growth hacks, Chris decided to try one of the techniques on the LifterLMS website. It’s so simple you might not even believe it could work. First, he added an exit-intent lightbox on every page of the site. Our exit-intent technology can trigger an optin to display when a visitor’s mouse motions towards the browser bar. That’s a sure sign they’re about to leave the site. Then, he added a form to the optin asking abandoning visitors if they had any questions. If someone is about to leave the site, it’s possible they’re leaving because they didn’t find the information they were looking for on your site. So, why not ask if they have any questions you can answer? Before using OptinMonster, every visitor intending to leave the site simply left. There was nothing to stop them or prompt them to stay. Now, over 90 visitors a month reach out to ask a question about LifterLMS. 90 visitors who were going to leave without a trace are now known and engaged. This optin is a great way to better understand the reasons why your prospects aren’t purchasing. It can help improve your pre-sales marketing materials, or the documentation you provide on your site. LifterLMS offers a free version of their software, as well as a more full-featured, premium plugin. The free version is offered at WordPress.org and at LifterLMS.com. At WordPress.org, visitors can download the plugin without sharing their email address, which wasn’t ideal for their freemium conversion rate. That wasn’t something Chris could change, but he could control the process at LifterLMS.com. Many visitors to LifterLMS chose to download the free version of the product as a trial before upgrading to the premium version. Chris added a lightbox optin requiring the visitor to share their name and email address before receiving a link to the free software. That optin is triggered by clicking a call-to-action button on the site, a feature we call MonsterLinks. Before adding this optin, every single free plugin user was totally anonymous. Since launching this optin, they have identified almost 7,500 free plugin users. LifterLMS can now market to that list in attempts to convert them to paying subscribers. With OptinMonster, LifterLMS was able to quickly and easily achieve their goals of increasing conversions and converting abandoning visitors into leads. LifterLMS has added $23,700 in revenue in just 5 months. 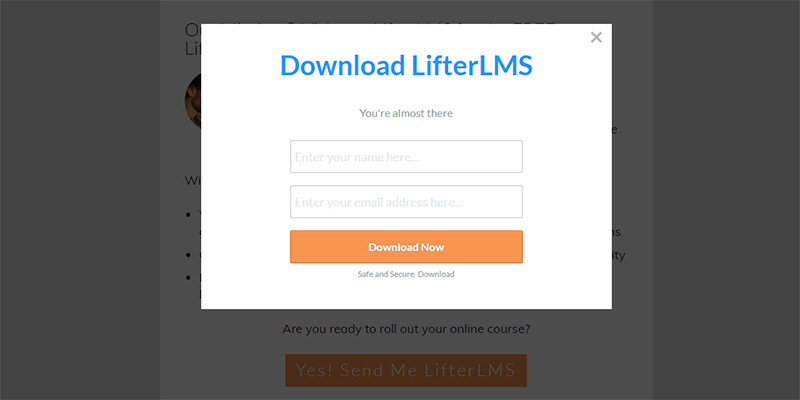 LifterLMS now gains over 90 leads a month that would have otherwise abandoned their site. LifterLMS has acquired the email addresses of over 7,500 free plugin users that were previously anonymous. LifterLMS was able to use OptinMonster’s exit-intent technology to capture leads and boost conversions, and it has had a huge impact in increasing the company’s bottom line revenue. Are you ready to reveal hundreds or thousands of leads hiding on your website? Get started using OptinMonster today.